Barbicide!!! I don't think we've ever shipped more 64 oz. Barbicide Disinfectants last week than I have in my whole time here at Pure Spa Direct! That's good though - everyone is keepin' it clean!... why? I have no idea... I'm just a shipping guy! See our great Barbicide Disinfectant HERE! Barbicide Wipes in the House! Barbicide has done it again - in wipes! These were flying out the door all last week. It's good to see that everyone is keeping their place clean and fresh. These wipes also have a nice scent to them, but maybe that's just me... why? I have no idea... I'm just a shipping guy! See our great Barbicide Wipes HERE! Barbicide Disinfectant Concentrate is a daily big seller at Pure Spa. This week, however, Barbicide Disinfectant Wipes were THE hot seller. They come in a cool tub with individually dispensed wipes. The guys use them from cleaning their hands AND for cleaning their sneakers. What do you use them for?... I have no idea... I'm just a shipping guy! See our great Barbicide Disinfectant Wipes HERE! Oh boy did we sell a lot of Barbicide products this week! Cleaners, jars, wipes and more were being ordered by the pallet load. It's nice to know everyone is keepin' it clean. How's that old saying go - 'Cleanliness is next to godliness'?... why? I have no idea... I'm just a shipping guy! See our great Barbicide selection HERE! Barbicide was hot this week! We sold gallons, half gallons, jars, and wipes. Seems like everyone is getting their clean on. That's a good thing if you're hittin' the salon/spa/hospital this week. I love seeing Barbicide at my Barber Shop because I know they're keepin' it clean... why? I have no idea... I'm just a shipping guy! See our great Barbicide selection HERE! Oh fall, how I love your cool nights, crisp air, and the onset of cold and flu season.... Wait, that's not right! I HATE the onset of cold and flu season! But it is one of those things that come with the changing of seasons and cooler weather. Obviously, cold and flu season is not the only time you should think about cleaning, sanitizing, disinfecting, and sterilizing in your spa or salon, but it is a great time to review your practices and make sure your salon or spa is protecting you, your employees, and your clients. But wait. Cleaning... sanitizing... disinfecting... sterilizing... Aren't those just fancy words that mean the same thing? If you thought that, you thought WRONG! In your business, you need to make sure you are addressing ALL of the above! Cleaning: removal of debris from the surface. 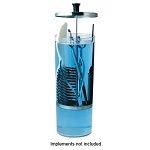 An essential first step to disinfecting or sterilizing. Sanitizing: lowering the number of microorganisms on non-living surfaces. Disinfecting: chemical process that eliminates most microorganisms on non-living surfaces and implements. Large surfaces, including chairs, beds, nail tables, styling stations, nail dryers, etc. should be disinfected between each client. Wiping these items down with a hospital-grade disinfectant such as Ultracare Disinfectant or Citrus II Germicidal Cleaner will help prevent the spread of germs from client to client. Implements should be cleaned (to remove surface debris) and completely immersed in a hospital-grade disinfectant such as Barbicide for at least 10 minutes after each use. Pure Spa Direct offers a wide variety of sanitizers, disinfectants, and sterilizers to meet all of your needs. We also have a huge selection of cleaning and janitorial supplies, and many other "Back of the House" office supply items to keep your business running smoothly. Remember, cleaning, sanitizing, disinfecting, and sterilizing surfaces and implements in your salon or spa is required by law! If you are unsure about your state's regulations concerning sanitization and disinfection, contact your State Board today to ensure you are compliant! Wanna keep your spa/salon clean and healthy? You need Barbicide! Use it for disinfecting tools to sterilizing tanning beds. These gallons and half gallons have been flying out of the warehouse this week and weeks prior. It's not a secret anymore... Get em today!... why? I have no idea... I'm just a shipping guy! See our great Barbicide Disinfectant selection HERE!